LAWRENCE, Kan. - Rob Phillips still remembers his first horse, a paint named Mickey he got more than 50 years ago. It was the start of a lifelong love affair with horses that's led to plans for an endurance race over the Santa Fe Trail. For the past year, the 62-year-old retired real estate developer and his wife, Beverly, have been putting together The Great Santa Fe Trail Horse Race. It starts Sept. 3 in Santa Fe, N.M. and ends Sept. 15 in Missouri, broken down into 10 rides of about 50 miles a day over 515 miles. Phillips got the idea after hearing the story of Francis X. Aubry, a trader who in 1848 made a $1,000 bet that he could traverse the trail from Santa Fe to its start in Independence, Mo., in six days. He took five days and 16 hours to cover the 800-mile route that normally took a month and established a record that stands to this day. "When I heard that story, I thought we've got to do something about the Santa Fe Trail and get the world excited about it again," Phillips said. Besides that, Phillips wanted to do something productive. "You've got to have something to do. You can dry the dishes only so many times," he said. So he came up with the endurance ride which will follow the wide, meandering trail that cuts southwest through 16 Kansas counties. The riders will cover the sweeping landscape of open prairies and rolling plains that greeted travelers heading west with trade goods or in search of a better place to live. "It will always be near to what we consider the trail. We're in real close proximity and I doubt we'll spend a night on land that wasn't camped on by people in covered wagons," Phillips said. The trail opened in 1821 when Missouri trader William Becknell became the first to use it to haul goods by mule train to Santa Fe, then part of Mexico. Although some settlers used the trail, it primarily was a trade route for bringing manufactured goods to Santa Fe and taking silver and other valuables back to Missouri. By 1880, the trail was eclipsed by the railroads and only the wagon ruts remained. "It set up a new excitement about trading and the expansion in the west," said Rita Napier, University of Kansas history professor. "It represents a reaching out to expand." Napier said the trail was important because more trade meant more manufacturing but it was especially important to Kansas because it helped shape the state's growth. "Once the territory was opened, it was a route that towns grabbed onto because there was a certainty of money coming in through trade," Napier said. "The Santa Fe Railroad followed the trail, which resulted in more towns." With that historic backdrop, Phillips put together what he hopes will be an annual event. "If you are going to do something, you might as well do it big, and if it's big you can see it," he said. He expects to have 100 teams with about 500 horses dashing over the landscape. Already, people from 17 states have signed up, paying entry fees ranging from $3,500 to $4,500. At first there was talk of prize money, but Phillips discarded the idea because he wanted the race to be more about the love of the sport than getting money. But, he added, winning has its own rewards. "It's about pride. It's a once-in-a-lifetime accomplishment," Phillips said. "Can you imagine? You can say you rode a race on the Santa Fe trail and won." After a long day in the saddle, riders will be able to rest at the "race village," a 30-acre area resembling a traveling fair, set up in 11 locations, including Elkart, Dodge City, Larned, Lyons, Council Grove, Burlingame and Gardner. Each morning, it will move to where the riders will be at the end of that day's race. It will include food vendors, a dining tent, merchants, farriers, veterinarians and places for riders to clean up and rest. Phillips said the race has attracted several sponsors, including the RFD-TV cable-satellite network, the U.S. Postal Service, the Bureau of Land Management and the Kansas Lottery. The Imus Ranch, a New Mexico ranch owned by radio personality Don Imus that helps children with cancer, is the event's designated charity and will get a portion of the entry and sponsor fees. There also will be a re-enactment of a Pony Express ride, with riders carrying mail from Santa Fe to Independence with 30 stops along the way. With the original Pony Express, young men rode 75 to 100 miles before handing off the mochila, or mail pouch, to the next rider. This time, it will be six riders alternating in relays over the 800 miles that won't be on the trail but close to it. "Now we have cell phones and pickup trucks," Phillips said. "Our riders won't be going that far." Outfitted as a Spanish explorer, George H. Cardinet Jr. led a team of re-enactors on a 900-mile horseback ride that snaked north from Mexico through California in 1976. The modern quest closely followed the path that Juan Bautista de Anza had traveled 200 years before. Cardinet, then in his late 60s, was one of the few riders to complete the journey that brought attention to his most passionate cause: He wanted the route recognized as a national historic trail. A trail activist since the early 1940s, Cardinet was considered by many to be the father of the California trails system. He was instrumental in developing the state's first long-distance hiking and equestrian trails and in getting legislation passed that established a federal trails system in 1968. Cardinet, who lived on a ranch in Concord, Calif., died Jan. 19 of unknown causes while visiting a friend in Mexico City, said his son, George H. Cardinet III. He was 97. "Without George, the national trails system wouldn't have the shape or breadth it does today," said Steve Elkinton, National Trails System program leader for the National Park Service. "George was larger than life, one of those giants on whose shoulders we all stand." The National Trails System Act recognized an extensive system of scenic and historic trails. It included the Pacific Crest Trail — even though it was not officially completed until 1993 — only after intense lobbying by Cardinet, said Nancy Dupont. She is director of the Heritage Trails Fund, a nonprofit she and Cardinet helped found in 1980 to develop and preserve trails. "He was as comfortable in a dirty old suede vest with sheep's blood on it as he was at a formal gathering in a tux meeting dignitaries," Dupont said. "He could work it either way." With his strong sense of history, Cardinet was drawn to the Anza Trail, named for the explorer who led the colonizing expedition to San Francisco Bay. Cardinet played a key role in getting the route designated a national historic trail in 1990, said Stanley Bond, superintendent of the trail for the National Park Service. "George was really good at capturing other people's enthusiasm," said Jeannie Gillen, a founding member of the Anza Trail Foundation. "He would seek out people that were younger than he was and put them to work on his passion." Born April 8, 1909, in San Francisco, George Hugh Cardinet Jr. grew up in Oakland. His father co-founded Cardinet Candy Co., maker of the U-No bar. The eldest of four children, he succeeded his father as president of the firm, which was sold in the early 1970s. His affinity for horses dated to the early 1920s, when he would work at a stable in the Sierra Nevada in exchange for taking a horse out for a ride. In 1934, he married Margaret M. Bowen. They had four children. About 1940, they moved to a ranch on 400 acres in Concord, where he lived until his death. Since Mt. Diablo State Park was "practically in our backyard," he began developing trails there, his son said. "He would take off up a hill on horseback with a roll of toilet paper and string it out to mark the various trails, and his friend would follow him with a bulldozer," his son said. Cardinet is credited with building more than 200 miles of trails in the park and throughout the East Bay. In the 1940s, he became actively interested in trail building when horses began "falling out of fashion," Dupont said, and he helped found the California State Horsemen's Assn., which worked to preserve trails. According to an oft-told story, the hard-charging Cardinet built the Heritage Trail Fund by organizing weekend rides in the mountains. "He would ride them ragged, and those who made it out at the appointed time would be nominated to the board," Elkinton said. "He liked challenging people, but underneath it all he had an extremely kind heart." In addition to his son, George, Cardinet is survived by two daughters, Maureen Casteel and Michele Tomasulo; a brother; 12 grandchildren, and 16 great-grandchildren. His wife died in 1992. Instead of flowers, the family requests donations be made to the George H. Cardinet Jr. Memorial Trails Fund, P.O. Box 612, Clayton, CA. 94517. The FEI is pleased to announce details of an International Forum on Medication Control, hosted by the UAE Equestrian Federation. The Forum will take place in Abu Dhabi, UAE, on Wednesday 14th February 2007. Location of the Forum is at the Police Headquarters on the outskirts of the City. It will commence at 12.00 noon and finish at 18.30pm. FEI National Federations are invited to send representatives to the Forum which is open to Riders, Trainers, Owners, Veterinarians and FEI Officials. Presentations will be given by senior personnel from the FEI Headquarters in Switzerland and the FEI Medication Advisory Group together with a representative from the FEI Central Laboratory in Paris, France. All expenses/costs in respect of travel, accommodation etc is to the charge of the delegate and is not covered by the organizer. There is no charge for the Forum itself. The American Endurance Ride Conference, the national governing body for endurance riding in the U.S.A., will hold its 2007 annual convention in Sparks, Nevada. The two-day program of seminars, informational meetings, and a free trade show is set for February 23 and 24 at John Ascuaga’s Nugget. Leading experts in equine health care and endurance-related fields will be featured at several seminar sessions. Other highlights of AERC's convention will include a trade show featuring vendors from across the country. Regional awards will be presented at an evening reception on February 23, and the convention will culminate with AERC's national awards the evening of February 24. Friday's seminar speakers include: AERC Hall of Fame member Julie Suhr (Trail Etiquette and Safety for the Endurance Rider); AERC member and humorist Angie McGhee (The Realist’s Guide to Endurance Riding); Hal Schott, DVM, PhD, DACVIM (Why Horses Do Not Finish Endurance Rides); Victoria R. Maxwell, DVM (Joint Health for the Performance Horse); Tom Sayvetz, MD, breeder of one of 2006’s top endurance equines, Heraldic (Can Pedigrees Talk? Legacy from the Desert); and veterinarian/farrier Olin Balch, DVM, PhD (Farriery Preferences of Endurance Riders). Saturday’s sessions include: national endurance team trainers Becky Grand Hart, an AERC Hall of Fame inductee, and Robin Groves (Mind, Body, Spirit: Training to Ride a More Competitive 100), an Ask the Experts panel with top riders John Crandell III, Steve Rojek and Ruth Waltenspiel, another Hall of Fame honoree; Trisha Dowling, DVM, MSc (The Pride Project: Establishing Normal Metabolic Changes in Endurance Horses); another presentation by Angie McGhee (Why Do I Do This and Why Does Everyone Else Seem to Do It So Much Better? ), and two-time winner of the prestigious Western States Endurance Ride – Tevis Cup, Erin Klentos (The Three-Year Development Plan for the Endurance Horse). The trade show will be located in the Nugget Pavilion from 8:00 a.m. to 6:00 p.m. on Friday and 8:00 a.m. to 5:00 p.m. on Saturday. Vendors at the free trade show will display a variety of products for long-distance riders—everything from saddles to jewelry to horse trailers. Also open to the public is the convention’s annual Friday night concert featuring award-winning cowboy singer Dave Stamey, which begins at 8:00 p.m. Tickets will be available at the convention for $10 per person. Veterinarians can take part in the seven-credit Continuing Education program on Thursday, February 22 from 8:00 a.m. to 4:30 p.m. at the convention. Convention registration can be made by phone to the AERC office at 866-271-2372. A complete convention overview and reservation forms are available online at http://www.aerc.org. The reservation line for John Ascuaga's Nugget is 800-648-1177. The AERC-International committee will conduct a business meeting on Friday, February 23, from 9:00-11:00 a.m. Meeting location to be announced in your registration packets and posted at the Convention Registration area. This meeting is open to anyone interested in attending. With a refreshing spirit of cooperation the McDowell Mountain Regional Park, the City of Scottsdale and the Scottsdale Preserve approved plans to for the first annual Scottsdale McDowell Mountain Endurance Ride. Utilizing the well groomed trails of the Park and the extensive trail system of the Preserve, the ride offers both a 25 mile limited distance ride and a 55 mile endurance ride. 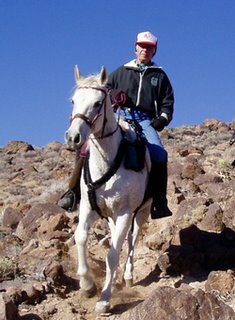 The Scottsdale McDowell Mountain 55/25 is an American Endurance Ride Conference sanctioned event and will take place Saturday, April 7, 2007. The 55 mile ride will utilize trails in the Preserve that have not yet been opened to the public. Preserve trail regulations limit the number of entries in the 55 mile ride to 50 horses, but the limited distance ride is contained within the Regional Park and has unlimited entries. If you are curious about the rapidly growing sport of endurance riding, the limited distance ride offers exceptionally good trails, an easy course and AERC veterinary controls, as well as helpful ride management and volunteers. The Ride will host a New Riders meeting on Friday to ensure a rewarding experience for those new to the sport of endurance riding and to address any questions or concerns the riders may have. An outstanding local Italian restaurant, L’Amore at 3159 E Lincoln Drive (602-381-3159) is catering the post-ride awards dinner. Horses Dacor (www.horsesdacor.com) of Dewey, AZ, whose products include Western and English tack, items for the long distance rider and horse, health supplies and supplements, has generously agreed to become a ride sponsor. Volunteers are needed for a wide variety of positions throughout the weekend of April 7, 2007. Endurance rides provide opportunities for those knowledgeable about horses and for those who just want to help and enjoy the exciting atmosphere without direct involvement with the horse and rider teams. Endurance riding offers the chance to see top equine athletes take on a challenging long distance course while the riders ensure their horses meet all veterinary criteria to be “fit to continue.” Riders who create exciting races to the finish as well as those who adopt the motto “to finish is to win” will be present. Please help support this event and promote equestrian use of our Park and Preserve. This is the first time an event has been permitted in the Preserve and the Regional Park is cooperating by providing adequate space for over-night horse camping, which is not usually permitted. Top level endurance riders from throughout the Southwest are expected to participate. Please come out to support this event taking place in our own backyard. Riders, volunteers and spectators are welcome! Please refer to the Web site at www.quacky.co.uk/~elsie/McDowell. If you have any questions, please contact ride manager, Rusty Toth at rusty@endurance.net. Equestrians from the Western United States will converge on Wickenburg Friday, Jan. 26 and stay through Sunday, Jan. 28. The Land of the Sun Endurance Ride is sanctioned by the A.E.R.C. and sponsored by the Wickenburg Horsemen's Association. It has gained a reputation for being one of the finest endurance rides in the Southwest, thanks in part to the many volunteers and sponsors from the Wickenburg area. While the Wickenburg Horsemen's Association does not generate a profit from the event, it does help protect and preserve many of the equestrian trails in the area. Equestrians will choose between a 25-mile and 50-mile course. In past years, top riders complete the 25-mile course in a little more than two hours and the 50-mile course in about four and a half hours. The top horses are typically Arabians. To ensure the safety of the horses, five veterinarians are stationed at rest stops to evaluate the condition of each horse before they are allowed to continue. Last year the completion rate was about 75 percent, but this will vary with weather conditions. To win, the horse must not only cross the finish line first, but must also pass a veterinary examination. In 2006, Morristown resident Maurene Serrano placed first in 25 miles and Wickenburg resident Bob Lowe placed second in the 50-mile race and also received the Best Condition Horse Award. Top finishers receive a buckle sponsored by a local merchant. For many riders, to finish is to win. For more information about the ride, contact ride manager Nancy Halsey at 684-3415. Ever thought of changing your life completely to pursue a dream? This Sunday, January 21, on Country Canada we’ll introduce you to someone who did just that. Myna Cryderman is a Manitoban who grew up a city girl, but developed a passion for endurance horse racing the led her to the top of the sport: she’s ranked number one in Canada. Myna shows us what it’s like to ride a hundred miles in a day -- the training and conditioning that horses and riders need to be capable of finishing a race. Then we’ll take you with us as we follow Myna through the toughest race of all… the Tevis Cup in the Sierra Nevada Mountains of California. With its dusty trails, steep inclines and treacherous cliffs, competitors are lucky just to finish the race. Join us for Myna Cryderman’s compelling story this Sunday, Jan. 21 on Country Canada, at 12 Noon on CBC Television. AERC is continuously looking at ways to improve methods of protecting the welfare of our horses in this rigorous sport of endurance riding. Heart rate recovery, specifically the ability to recover within a defined time period, is undeniably a key factor in identifying horses that are at risk for impending metabolic problems. This fact is supported by the experience of many AERC veterinarians, is described in the AERC Veterinary Handbook "Pulse recovery with rest has become the main objective measure of fitness to continue. ", and is supported by research (there is a good French research paper that shows horses should recover within 20 minutes of exercise). Evidence states that long distance horses in a stable metabolic state should have the ability to recover within 30 minutes. Horses not recovering within 30 minutes are at risk for a metabolic problem. This is the reasoning behind the current AERC rule that all horses must recover within 30 minutes at checks during the ride, except the postride exam in endurance rides. Certainly, identifying those horses that are not recovering within 30 minutes will identify the horses that are at metabolic risk post ride. Additionally, a vet exam protocol at the finish that is consistent with the rest of the ride should naturally encourage riders to ride as conservatively to the finish as they have the rest of the ride. There are several issues to consider when changing the post ride exam maximum time from 60 minutes to 30 minutes. The first issue is the expectation of the horse to recover to a set heart rate within 30 minutes vs. 60 minutes. Regarding the first issue, there is enough data to support the fact that a horse in stable metabolic condition should have the ability to recover within 30 minutes. The AERC Veterinary Handbook states in reference to evaluating fit to continue "a recovery rate of 52 - 60 bpm within 20 minutes of arrival is a reasonable expectation". Endurance veterinarians would agree that a horse taking 55 minutes to recover is not metabolically normal nor fit to continue and is likely in need of medical attention. AERC has recognized this fact by requiring horses at all vet checks during the ride to meet criteria within 30 minutes. This rule was good progress for the protection of horses in this sport. We should keep in mind that horses at the finish are expected to be "fit to continue". The "fit to continue" rule at the finish was a major change for AERC and fought hard for by previous veterinary committees. Allowing 60 minutes for recovery at the finish was apparently not based on medical reasons, rather it was based on politicalc ompromising. Apparently, in order to get membership and board acceptance of this ruling change that previously allowed lame, sick horses to complete rides,the veterinary committee compromised with allowing 60 minutes to recover at the finish line. Allowing 60 minutes at the finish is not medically nor logically consistent with the reasoning behind requiring 30 minutes at all other checks and should be one of the reasons we are now reevaluating the post ride exam criteria. The second issue is the question of when is the optimum time for veterinarians to be looking at the horses. Horses can develop signs of colic an hour or even hours after the ride. The current rule allowing 60 minutes to present your horse does not necessarily help with recognizing these horses either as many riders wisely tend to present their horse as soon as possible after the ride in order to receive their completion before the horse stiffens up, gets in a wreck, etc. Typically, the riders who are not presenting soon after the ride are the riders whose horses are not recovering and these are the very horses we need to be looking at. Just because we currently allow one hour does not mean horses are being examined at one hour. It is very important for all riders whose horses have completed the ride including passing the post ride exam to continue to observe and monitor their horses and seek medical care when needed. This rule change will not affect that responsibility. Almost half (3 out of 8) fatalities in 2006 occurred post ride which clearly points out the importance of post ride monitoring. A third issue is the situation where the finish line is some distance from where the final check will occur. The 30 minute post ride exam rule has apparently worked logistically well enough for the large number of LD rides within AERC. As with all rules, common sense must prevail. It is a simple issue of the head veterinarian and ride manager working together to account for the necessary time required to walk from the finish line to the camp/vet check. The important point here is convenience should not outweigh the safety and welfare of our horses. A final issue are the concerns of those riding non-Arabian breeds. A non-Arabian that has the ability to recover to 30 minutes at all other checks during the ride should have the ability to recover within 30 minutes at the finish line. 1) Meeting criteria within 30 minutes meets the definition of "fit to continue", 60 minutes does not. "Fit to continue" at the finish was introduced as a way to improve the safety and welfare of the horses throughout the entire ride, not just to the last vet check on the trail. 2) Riders riding with a mindset they have to pass another "real" vet check where the horse will be expected to meet recovery within a reasonable amount of time may adjust their riding accordingly as they have throughout the entire ride. Near the end of a ride, where the horse is most fatigued and prone to both mechanical and metabolic injury, is not where we should be lightening up criteria in order to allow faster riding. In reality, this will likely not affect the way the majority of the recreational endurance riders ride, but it may serve to put checks in place for those riding at the competitive level. 3) Riders that have chosen to override their horse to the point the horse does not recover as a healthy horse under exercise should, within 30 minutes, should not be recognized and rewarded as completing the ride. A vocal section of the membership has been opposed to this rule change. This is not surprising, as changing post ride criteria from "sound at a walk" to "fit to continue " met very heavy opposition from the membership for many years. Change is not easy to come by. Fit to continue at the finish is now commonly accepted and even expected as an important improvement in the protection of our horses and the rule change we are discussing now may years down the road fall into that same category. AERC should be proud to be an organization that has the expectation of its horses being "fit to continue" at the completion of competition. A recovery time of 30 minutes is physiologically consistent with a horse that is fit to continue while a recovery time of 60 minutes is not. The question we should be asking ourselves is do we want horses completing rides to be truly "fit to continue"? The United States Equestrian Federation (USEF) held an open forum strategic planning session in conjunction with the USEF annual meeting in Louisville, Kentucky. The meeting was hosted by USEF in response to requests for joint evaluation of the state of International endurance competition: the USA no longer dominates the sport at the International level, as measured by a failure to win individual or team medals during the last four World Endurance Championships. The meeting was hosted by USEF staff John Long (Chief Executive Officer), Jim Wolf (Executive Director, Sports Program), Don Whittle (FEI Affiliates Managing Director), Vonita Bowers (Endurance Discipline Director), Lynne Mcoy (Director of NGB FEI services) and Jennifer Brown (Adm. Assist. FEI Affiliates). In attendance were USEF members including Art Priesz Jr (Chair. of the USEF Endurance High Performance committee), Julie Bullock DVM (Chair of the USEF Endurance Active Athletes committee) and representatives from AERC, the USEF recognized National Discipline Club for the sport of Endurance. Close to 100 interested and concerned members filled the room for this landmark meeting. This was the first strategic planning session that the USEF has hosted for the sport of Endurance. It was judged a great success and an important step in moving the USEF Endurance program forward. 1) Identification of major issues and concerns: A round-table discussion allowed individuals to discuss and identify key concern topics which included: the need for improvements in training of athletes; improved methods of identifying and selecting best performing athletes; lack of 'grass roots' support from the AERC (National Discipline Club) for International athletes and endeavors; improvements in communication between USEF staff, officers and membership; the need to form a long range program to recruit new talent and young riders; the desire of the membership for greater accountability and transparency of process from USEF staff. 2) Discussion of the organizational structure of USEF: Explanation of officer, staff and committee responsibilities and hierarchy; explanation of USEF's relationship with the FEI and the USOC. John Long emphasized that the most successful disciplines in the USEF (medal winners) were those disciplines that had a very strong relationship between the USEF and the National Discipline club. Both Mr. Long and Jim Wolf extended a warm welcome for the new Endurance Discipline Director, Vonita Bowers, and felt that she would be instrumental in improving the Endurance program. Jim Wolf made it clear that the USEF was fully committed to improving the program. 3) Presentation and discussion of USEF's Medication Position by Kent Allen DVM (previous Eventing team vet): emphasis on welfare of the horse; the need to stay current in regards to FEI drug testing (procedures, detection levels and time, prohibited and/or allowed substances); an explanation of FEI laboratories, with four labs positioned around the world (USA/USEF, Hong Kong, France, Australia) working towards harmonization, whereby each lab would follow same testing methodology to produce identical testing results. Dr. Allen stated that while the incidence of 'positives' in the sport of Endurance is generally low, the rate of increase is highest among all disciplines. Jim Wolf emphasized that USEF is fully committed to following the highest standards when implementing medication rules and policy in FEI competition. 4) Open session discussion to develop strategic plan for Endurance success and excellence in the International field: compilation of a vision - what would it look like if USA competitors were the best in the world? We would have a program that is rider centered, coach driven and USEF (National Federation) partnered. We would have a strong industry centered around the sport (trainers, breeders, sponsorship, etc). We would have a large community of athletes enthusiastic about aspiring to International level competition. We would have a large pool of fast sound horses - and they would remain within our borders. We would have confidence in our leadership. Our leadership would be focused on the clear mission of striving for excellence abroad. We would consistently medal in foreign Endurance championships. The general tone of the meeting was very positive and productive. A professional moderator maintained forward motion and assured that every voice could be heard. The majority of the attendees expressed some level of previous dissatisfaction with USEF which ranged from lack of transparency in process and decision making to failure to communicate adequately with the general membership; to frustration at the lack of guidance or support in the fundamentals of athletic endeavor. Both the USEF staff and the membership supported the notion of a fulltime USEF staff person fully dedicated to identifying, training and supporting the athletes (e.g. coach or national chef d'equipe). The USEF suggested that they instigate a search committee to identify chef d'equipe candidates. They also agreed to evaluate the existing staff/committee/membership relationship and ensure that channels of communication would improved. The session closed at 5pm, with a promise to make this an annual affair, and personal invitation from John Long to continue the discussion in the bar, he's buying. The ARG NF has decided to change the venue for the 2007 Junior/Young Rider World Endurance Championship. The new venue is the Campo de Mayo “Escuela Militar de Equitación” one of the most well known equestrian venues in the region where several major equestrian international competitions in several disciplines have already taken place. The new venue is only 35 km. away from Buenos Aires downtown. The remaining details are as indicated on our website www.mundialyr.com.ar. La Federación Ecuestre Argentina informa que se ha decidido el cambio de sede del Mundial Juvenil de Endurance. El mismo se realizará en la Escuela Militar de Equitación de la Republica Argentina ( Campo de Mayo), una de las sedes hípicas de mayor prestigio en la región, donde ya se han realizado importantísimas competencias hípicas en varias disciplinas. La nueva sede está situada a sólo 35 km del centro de Buenos Aires. 17 de marzo se realizará una prueba internacional abierta de 100 km. La entrega de premios se efectuará en esa misma sede el día sábado 17 en horario a confirmar. El resto de los detalles son los indicados en nuestra página web www.mundialyr.com.ar. Próximamente daremos a conocer el anteprograma aprobado por la FEI. The Endurance International High Performance Committee wishes to announce the following rides as Selection Trials for 2007 and beyond (Pending Approval of new Procedures for Rider Ranking, Team Selection and Endurance Selection Trials by the USEF Executive Committee). Points may be earned at the events listed below toward placement on the Endurance Rider Ranking List. Additional events may be added at a later date. This memo will be posted on the USEF Web site. At the 2006 Death Valley Encounter ride Les Car and Tulip completed yet another AERC endurance ride, to become AERC's highest mileage horse on record. trotting down the center of 395 by himself. Just moments after having bucked Les off going up a hill. Tulip stopped when I called his name and waited for me to come and get him." As of December 30, 2006 Tulip surpassed the 18,215 mileage of previous record holder Rushcreek Lad, owned by Trilby Pederson.